At this point in my hand plane collection, I am willing to try building a hand plane. I currently have a Lie Nielsen #4 bench plane, a Lie Nielsen #60R rabbeting block plane and a Veritas low angle jointer plane. A while back, I bought David Finck’s book, Making & Mastering Wood Planes, and even after reading this book, which devotes 192 pages to every aspect of making and using wood hand planes, I still felt intimidated at the thought of building one. When contemplating a fun gift for my recent 55th birthday, I told my wife I wanted a Hock Tools Shoulder Plane Kit. My thinking was building a kit will help ease me into the world of making hand planes – not that I envision making a lot of wooden body hand planes. I don’t, but maybe a couple or three; we will see. The photo at the top of the post shows the kit with all the parts. A benefit of plane building from a kit is that the folks at Hock Tools have already milled-up the parts, at least to a near final form. The parts are crisply formed, straight and square. Makes me wonder if they were formed via a CNC machine, not that there is anything wrong with that. My only concern after glue-up was the possibility that I did not spread enough glue. There seems to be some flex in the plane body after the blade is positioned and the wedge tapped in place. Pressure from the wedge forced the sole of the plane to be un-flat (is that a word? Out of flat, non-flat, flat-less). In the video at the 8:50 mark, Ron Hock advises a second flattening of the sole with the plane blade inserted, but retracted; wedge in place. I assume this is to correct the out of flat situation naturally caused by wedge pressure. 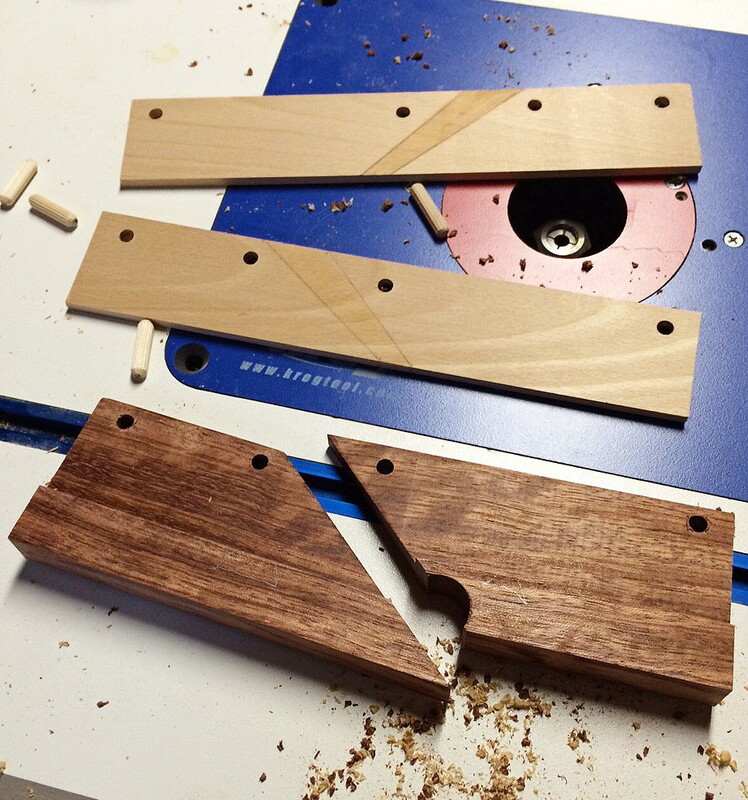 So, no issue with my glue-up; this re-flattening is standard plane building stuff. After router work and sanding. The mostly completed shoulder plane. 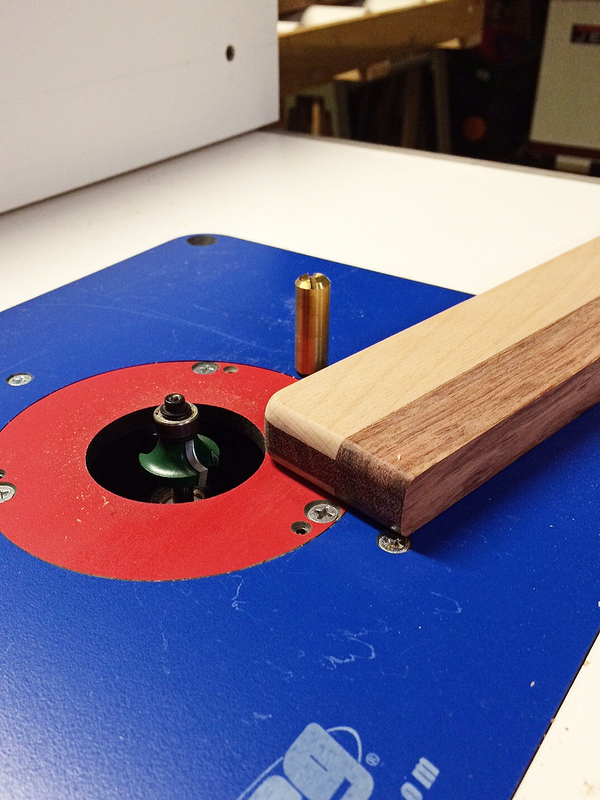 With assembly and shaping completed, all I have to do now is figure out what an appropriate finish would be. Ron suggests oil. 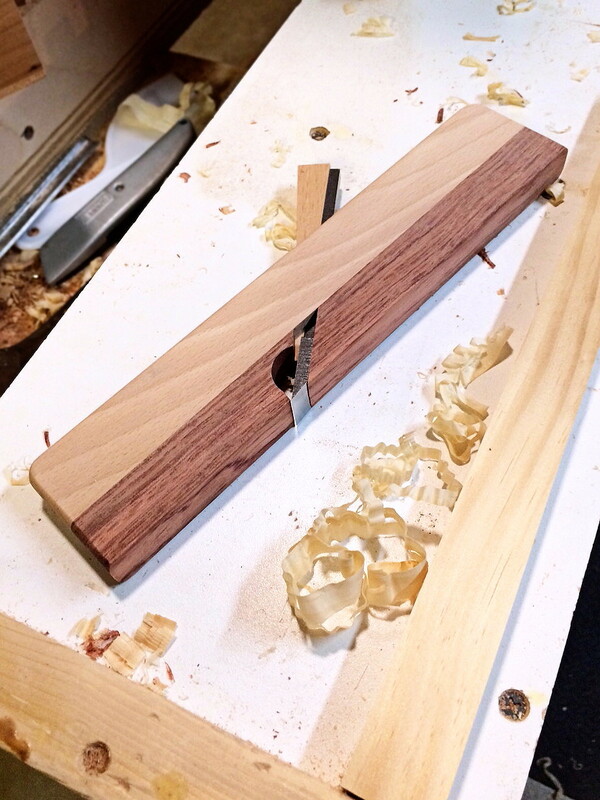 Using a wooden body hand plane is sooo different than a metal body plane. As seen in the video, the adjustments to a wood hand plane – a hammer tap or two on the back, maybe another on the blade, all done to get the plane cutting well is interesting and takes some getting used to. But, I finally got some decent shavings. And the tapping with a hammer is kind of cool to do. All things considered, a fun project. And Hock Tools offers an eleven inch long bench plane kit. I guess that would make it like a #4 1/2 bench plane? I don’t have a jack plane, so I may just download the plan; make it a little longer and buy a blade and chip breaker. That is very interesting Jeff. I had toyed with getting this kit but like you I was always kinda intimidated with building my own plane. One day I really needed a router plane and was looking on Ebay. Those prices are new prices and ones I couldn’t afford so I made one. Bought the blade set and now I have a great plane. WAY WAY easier than I ever anticipated. I’m glad it turned out well for you and I do need a shoulder plane so will look into this. Thanks Jeff. Hummm, I need a router plane too. 🙂 Did you follow a plan for your router plane? I did not see that on the Hock Tools site. http://intothewoodshop.com Where I found the plan. https://plus.google.com/u/0/+OneCarWood/photos/photo/6106630947206694658?pid=6106630947206694658&oid=105769966467475677590&authkey=CJbPs4jusqeSowE. Huge link but here is the video I made on the one I did. Yours looks great, Jeff. Are you going to shape it, or leave it like it is? I am going to leave it as is. It is very comfortable with the edges rounded. Paul Sellers has a utube video on making a poormans router with a chisel. Jeff good build, I want to make a 32 inch wooden hand plane next. I plan on using beech and walnut. I have a shoulder plan i made with dogwood and teak i had laying around the shop . It came out better than I thought it would. Man, I’d like to have a 32″ jointer. Sounds pretty cool. I don’t think I have ever seen dogwood in board form. Anybody ever use Japanese plans? I have been interested in them. They seem much easier to make to me and the sole is intentionally not FLAT! Not me, and I’m not sure I could get used to pulling a plane. Probably no big deal. It is easy. The plane blade arrived sharp, but crazy sharp is so important. I did just minimal sharpening. Hick Tools has a good block plane kit and a larger bench plane kit. I already have these covered otherwise I’d order those.